Clear skies with a few passing clouds. Low 39F. Winds E at 5 to 10 mph. In an August 2018 Gazette photo, Paul Ryan laughs during a campaign stop as 1st District Republican candidate Bryan Steil looks on. Steil and Ryan linked up again Saturday in a series of campaign stops as Steil heads into Tuesday’s midterm elections and a faceoff against Democratic challenger Randy Bryce. At the Republican campaign office in downtown Janesville on Saturday, Bryan Steil shook hands with friends, family and campaign workers. He gave them a final pep talk as the zero hour for the midterm election approaches. 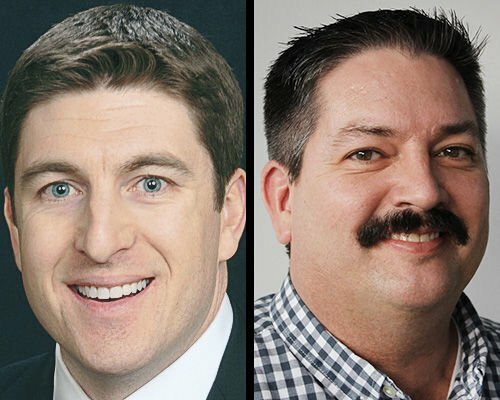 With Tuesday’s Election Day looming, the 1st Congressional District candidate found himself flanked by U.S. House Speaker Paul Ryan, whose seat Steil hopes to win. Ryan is retiring after this term, leaving the seat up for grabs. Steil, a Janesville resident and an attorney for private manufacturers, is running against Randy Bryce, a Democrat and an iron worker from Caledonia. Steil and Ryan’s Janesville stop together Saturday came in the midst of Ryan’s whirlwind, 50-stop campaign tour supporting about two dozen different Republican candidates around the country and, most recently, within Wisconsin. Steil and Ryan were scheduled to make several appearances together Saturday, and Steil planned to continue campaigning in eastern parts of the 1st District during the final hours before the election, his campaign said. As both Steil and Ryan rallied Steil’s campaign troops Saturday, neither the retiring House speaker nor Steil mentioned Bryce by name. Their audience of about 25 family members, friends and campaign workers weren’t ones who’d need much persuading. Steil and Ryan both appeared relaxed, clad in blue jeans. Ryan, who had been deer hunting on a Rock County farmer’s land earlier Saturday, had on a dark shirt and a tan vest. Steil was in a red, UW Badgers windbreaker. Steil and Ryan were jovial, ribbing a few men at the event who had sprouted fall beards. Paul Ryan’s eyes widened, and he laughed. “I am,” Steil said over the crowd’s chuckles. A September public poll by The New York Times showed Steil held a 5 percentage point lead over Bryce, but some other polls show a much tighter race. A late October poll by Change Research showed Bryce with a 1 percentage point lead over Steil. Brandon VerVelde, Steil’s campaign manager, said many of Steil’s campaign stops this week will be focused on trying to motivate people who otherwise might not vote and, moreover, to shore up or sway remaining independent and undecided voters. Bryce’s campaign announced he was making stops Saturday throughout central and eastern parts of the 1st District, rallying his own base into the home stretch. When asked about public polls in the Steil-Bryce race, Ryan was mostly dismissive. “I don’t put a whole lot of stock in those. It’s comforting because he’s (Steil) doing well, but you’ve got to act as if you’re behind, every single day,” Ryan said. In a debate between Steil and Bryce last week in Janesville, neither candidate wasted time shooting sparks at the other, particularly when it came to their vastly disparate views on national health-care policies (Bryce says he wants a single-payer health insurance system, and Steil vowed such a system would amount to a “government takeover” of health insurance). Ryan, who has watched dogfights over congressional seats play out in countless elections in his 20 years in Washington politics, said he has learned the biggest secret in a campaign is to connect with individual voters, especially in the last days before an election. “They want to elect somebody who fits their district well,” Ryan said. Ryan’s simplest, late-inning campaign advice to Steil? “Just make sure you’re you, and make sure they know you,” he said. Polite critics of Steil have called him a “protégé” of Ryan, while others have less politely characterized Steil as a Paul Ryan “clone,” someone who has known and learned from Ryan for years. Steil mostly dismissed those comparisons Saturday, instead touting his own background in private manufacturing and his place on the UW System Board of Regents. Yet, Steil said certain behaviors he believes Ryan has shown are worth emulating. “I think everybody brings their own background to the table,” Steil said. “At the same time, you can learn a lot about the character of a man like Paul Ryan. You can disagree without being disagreeable. How do you have a conversation? How do you work with people to try to achieve results on their behalf?” Steil said. Ryan and Steil joked that maybe their haircuts are too similar. “What you need is a widow’s peak,” Ryan joked. “Or a ponytail,” Steil said. If Steil wins the election, Ryan said hee has no immediate plans in his own retirement to act as a political advisor to Steil. “I’m not head coach material for basketball,” Ryan said.